Gorgeously designed hotel with wonderful views, a sparkly pool, and a nice bar, far enough above the madding crowd to feel quiet and special but very close for walking. breakfast was excellent and the crew were extremely nice and helpful! Eating breakfast on the balcony enjoying the fantastic views.The pool and sun beds were lovely . Excellent location, pool, rooms and staff. All made for a very special holiday. From the moment we arrived the staff and owner could not have been more welcoming. After complimentary welcome drink and snacks we were personally showed out beautiful room with a brief of the facilities. The hotel far exceeded our expectations, from the gorgeous infinity pool lit up on arrival and the beautiful view of Parga town and beaches blew us away. With only 16 outstanding rooms individually designed by Chris the owner made the place more special, I have never been on a holiday before were everyone talked to everyone. A real gem of a hotel and I would definitely go back. Lock in a great price for Irida Boutique Hotel – rated 9.7 by recent guests! One of our top picks in Parga – and a guest favorite. 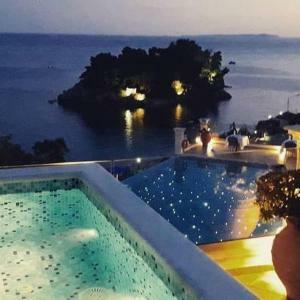 Irida Boutique Hotel sits amphitheatrically on the green hillside, and above the picturesque island in the bay of Parga. 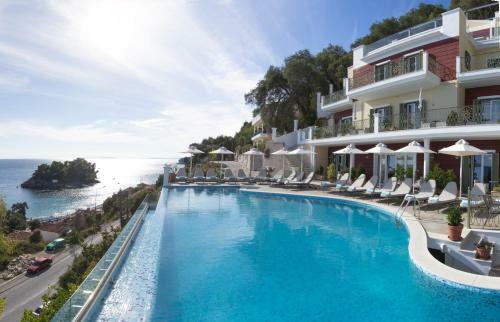 It offers stylish suites with breathtaking views of the Ionian Sea. Backed by olive groves, the Irida Boutique Hotel's privileged position offers unrivaled views of the magnificent Venetian Castle of Parga. The suites’ balconies offer views of the Ionian Sea, stretching out to the islands of Paxoi and Lefkada. Irida suites are inspired by the Mediterranean, each with its distinctive color theme. All are generously equipped with stylish interiors, elegant living rooms, marble-lined bathrooms and cleverly concealed kitchen areas. This property also has one of the top-rated locations in Parga! Guests are happier about it compared to other properties in the area. 뀐 Located in the real heart of Parga, this property has an excellent location score of 9.8! When would you like to stay at Irida Boutique Hotel? Elegant and spacious room with balcony facing Parga Beach. It features a seating area and offers free Wi-Fi and air conditioning. Kindly note that room photos are indicative as all room types are individually decorated with different color schemes. Spacious and smartly decorated suite with balcony facing Parga Beach. It features a seating area and offers free Wi-Fi and air conditioning. Elegant and luxurious suite with sea-view balcony. It features a comfortable living area and a large and modern bathroom. This suite features a balcony, seating area and mini-bar. House Rules Irida Boutique Hotel takes special requests – add in the next step! Irida Boutique Hotel accepts these cards and reserves the right to temporarily hold an amount prior to arrival. Kindly inform the hotel prior to your arrival in order to get assistance with your baggage, as the exact location of the property includes a brief uphill walking distance. Can't think of a thing - it's gorgeous. Would have preferred a private balcony and do not remember that was part of room package as we would have opted for more personal space. The swimming pool and breakfasts were excellent. Staff were attentive, helpful anf friendly. Best hotel we have ever been! Great people that make you feel special; fantastic location , room decoration and sea view; great pool; very tasty food, breakfast served in the room...just perfect for a very relaxing and special holiday!!! Great location, big and confortable room, great swimming pool, best view, staff super helpful!!! !